Why Study Monoslope Barns and Air Quality? Confined cattle facilities are an increasingly common housing system in the Northern Great Plains region. Many of these facilities add organic bedding material to the pens once or twice per week. Particulate matter concentrations and emissions from these facilities have not been evaluated. The objective of this study was to quantify particulate matter concentration adjacent to a deep-bedded mono-slope facility housing cattle and to compare the concentrations during normal operation and a bedding event. 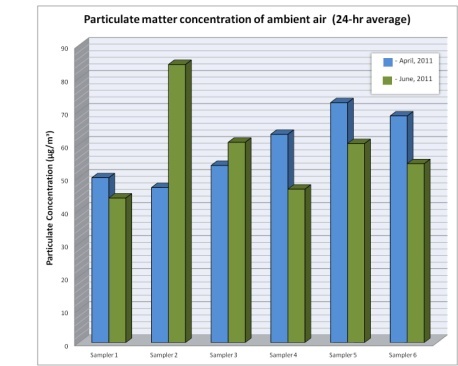 Average 24-hr total particulate matter concentration of ambient air collected from a beef deep-bedded monoslope barn. Three Lo-Vol Particulate Samplers were placed 4.6 m from the north side of the building, and three were placed 4.6 m from the south side of the building with 36.6 m between the samplers on each side. Average sampler flow rate was 16.7 L/min. Samples were collected over two five-day periods (April and June 2011). Each sample period included three 24-hr collections during normal operation and two 3-hr collections during a bedding event. Filters were collected, conditioned for 48 hr at 21.1 °C and 35% humidity, then weighed in micrograms and analyzed on a Beckman Coulter LS 230 to determine total suspended particulate matter (TSP). Average 3-hr total particulate matter concentration of air collected during a bedding event of beef deep-bedded monoslope barn. During the April sampling period, average 24-hr TSP concentration ranged from 40.1 to 91.4 µg/m3 during days of normal operation. 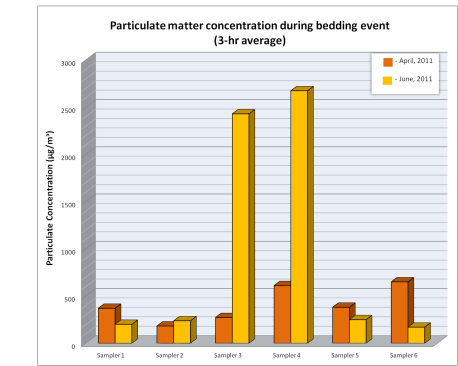 Average 3-hr particulate matter concentration during bedding events ranged from 281.8 to 540.5 µg/m3. During the June sampling period, 24-hr TSP concentration on days of normal operation ranged from 52.7 to 64.6 µg/m3, while 3-hr particulate matter concentration during bedding events averaged 302.4 to 1684.2 µg/m3. Sweeten et al. (1998) reported average TSP concentrations of 410 µg/m3 measures for 24 hr periods on open feedlots in Texas. In general, particulate matter concentrations adjacent to the deep-bedded monoslope facility were lower than previously reported for open lot feedlots. Concentrations of TSP were higher during the 3-hr bedding event than during normal operation. To compliment this research, data has been collected from two monoslope beef barns over the past two years as part of an AFRI-funded research grant. MiniVol particulate samplers were used to determine PM-10 and PM-2.5 concentrations over 24-hr periods. Data collected from this project will further define the particle size of dust being emitted from these facilities. Sweeten, J. M., C. B. Parnell, R. S. Etheredge, and D. Osborne. 1988. Dust emissions in cattle feedlots. In Stress and Disease in Cattle, Veterinary Clinics in North America. Food Animal Practice 4(3): 557-578. The authors wish to acknowledge James (Bud) Welch and Alan Kruger for assembly and disassembly of the particulate matter sampling equipment and Ron and Clayton Christensen for the use of their cattle facility. Mention of trade names or commercial products in this publication is solely for the purpose of providing specific information and does not imply recommendation or endorsement by the U.S. Department of Agriculture. USDA is an equal opportunity provider and employer.